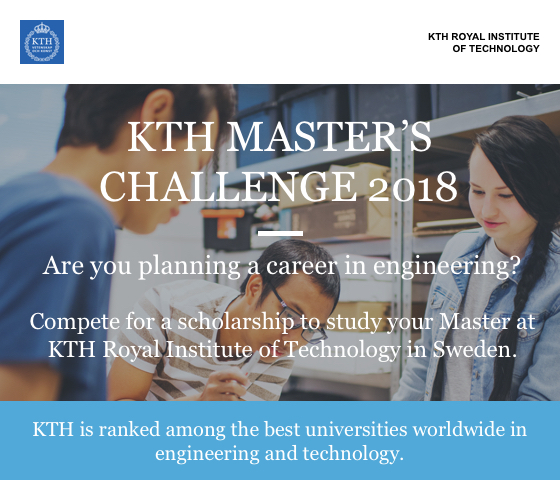 KTH Royal Institute of Technology in Sweden offers you a unique opportunity to study a two year master’s programme within a variety of engineering disciplines. You can study at one of the leading technical and engineering universities, located in Stockholm, a cosmopolitan and thriving city. You will also have the opportunity to explore the rest of Sweden and Scandinavia, famous for beautiful nature and the fascinating northern lights. Take the KTH Master’s challenge now and show off your skills. You could win a scholarship that covers the full tuition costs for a two-year Master’s programme! The application deadline is November 21, 2017. Don’t wait to sign up, apply here !